Home / Blog / Blessing Israel / What is Shavuot? At My Olive Tree we are preparing to celebrate Shavuot on June 11th. What is Shavuot? This is a special time where we celebrate the gift of the Torah (or instruction). Historically, Shavuot was a holiday celebrating the abundance during the grain harvest. This festival, in ancient times, centered around the agrarian culture of the Jewish people living in Israel. During this time the people also brought their first fruits of the seven species (Wheat, barley, grapes, figs, pomegranates, olives, and dates) as an offering to the temple in Jerusalem. This was an act of thanksgiving for all that the Lord had provided for them throughout the year. In modern times, this feast is celebrated with traditional foods that are centered around dairy products and honey. Milk symbolizes the nutrients we all receive when meditating on the Word of God, and honey represents the sweetness of a good God. Although this season is typically filled with cheese blintzes and sweet cakes, we thought that we would share a healthy alternative to place in between all of those terrific treats you may be sampling. 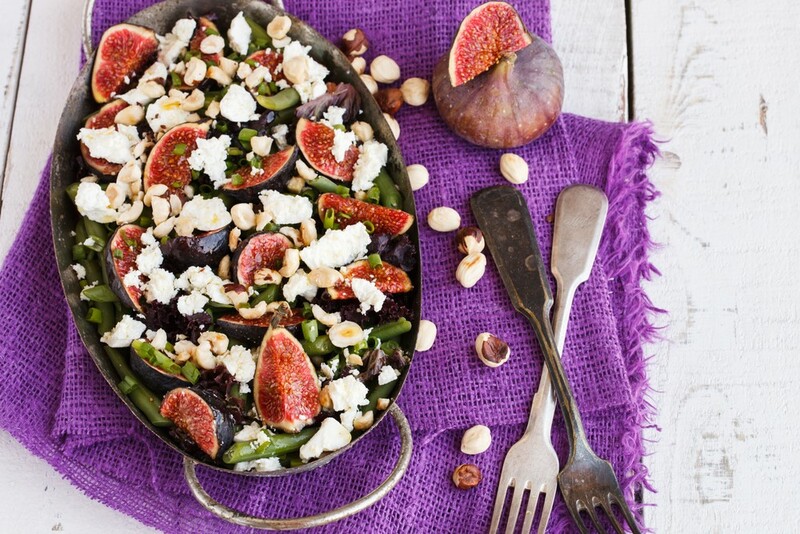 This salad incorporates a savory goat cheese in juxtaposition with the sweetness of the fig. Yum! Preheat the oven to 400°. Spread the walnuts in a pie plate and bake for 8 minutes, until golden. Let cool. In a very large bowl, whisk the mascarpone, vinegar and both oils; season with salt and pepper. Add the toasted walnuts, kale, endives, radicchio, and figs; toss well. Season the salad with salt and pepper. Crumble goat cheese over the salad. If you’re looking for an excellent, high-quality extra virgin olive oil to enjoy, look no further! My Olive Tree’s, Extra Virgin Olive Oil from Northern Israel is light and full of delicate flavor; our Northern Israel oil is perfect for salad dressings, marinades, or as a hummus topping! It mixes well with the spices of your choice leaving you with a smooth and well-balanced flavor.